Student Adventures: What’s inside the moon? Scientists have taken their first, vicarious journey to the center of the moon, thanks to a fresh look at 30-year-old moonquake data from the Apollo era. What the researchers found deep in the lunar interior: a solid iron ball 300 miles across, wrapped in molten iron another 56 miles thick, topped with a 93-mile layer of partially molten material. The effort represents the first direct observation of the moon's core and the depths of its various layers, says Renee Weber, a lunar scientist at the Marshall Spaceflight Center in Huntsville, Ala., who headed a international team of scientists on the project. The notion that the moon has an iron core with a layer of molten iron surrounding it isn't new. But evidence so far has been indirect. The new look confirms that picture. But also appears to be breathing new life into data once thought to be poorly suited for detailed studies of the deepest portions of the lunar interior. “I think there's a lot more that can be done with these data,” Dr. Weber says. 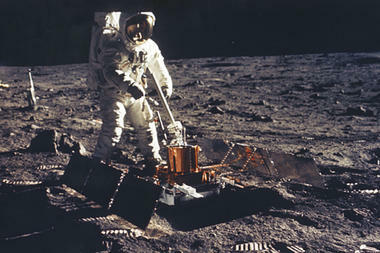 During the Apollo program, astronauts left four seismographs on the lunar surface. The instruments returned their last data to Earth in 1977, five years after the Apollo program ended. The goal was to use seismic waves generated by moonquakes to probe the moon's structure, just as geologists on Earth use earthquakes to study Earth's interior structure and astrophysicists use acoustic waves from “star quakes” to study the interiors of stars. But the heavy pummeling the moon has taken throughout its history has severely fractured the region between the crust and core, meaning that seismic waves were degraded, making them too difficult to interpret. But new ways of analyzing less-than-ideal seismic data, developed for use on Earth, plus the rapid increase in computing power since the days of Apollo, prompted Weber and her collaborators to give the Apollo data a fresh look.